Asks fans for patience regarding that mysterious finger. 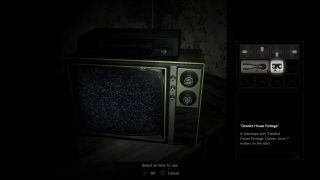 People have been combing the Resident Evil 7 demo for secrets, in much the same way that people combed Konami's P.T. That resulted in a hidden trailer for the doomed Silent Hills, but keen investigators have uncovered basically squat this time, despite various loose ends and mysterious objects hinting that there's more to be revealed. I've been checking in on that thread regularly, and while it's slowed down significantly as people accept, one by one, that they might be wasting their time, Capcom has poured fuel on the fire via an email sent out to fans. The email boasts that two million people have downloaded the demo, while an accompanying image teases a use for the mysterious dummy finger that has been vexing fans for a couple of weeks now. Said finger—an item you can find in the demo—has a little hooky bit on the end that looks slightly like a key, but there's no use for it that eagle-eyed fans have been able to discover. The message on the image—"the path for now is closed, but patience..."—suggests that there's nothing else to discover in the demo for the moment, while the presence of the finger hints at an upcoming update that will, in fact, add more stuff.